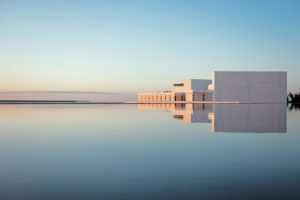 The Hotel Mar Adentro floats dreamily above the ocean at San Josè del Cabo on Mexico’s Baja California Sur coastline, perfectly poised between sky and sea with the desert at its back and the turquoise waters and coral reefs separating Isla del Espìritu Santo and Balandra La Paz spreading out before and around it. A world of whales and sea turtles, marine reserves and wind perfect for wind and kite surfing. 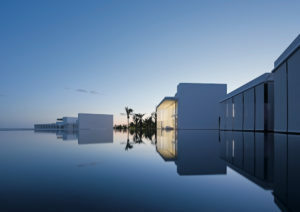 Architect Miguel Angel Aragonés defines his creation thus: “Mar Adentro is a kind of Medina that opens out onto the sea. Each floating volume contains interiors that in turn form, in turn, independent universes.” The resulting complex melds seamlessly into the surrounding landscape, creating an island of different modules linked by walkways of dark stone. 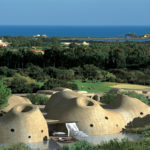 The dramatic impact is further enhanced by the fact that the various cement and glass elements are reflected in the sea and defined by the horizontal line of the sea which extends into the structure. 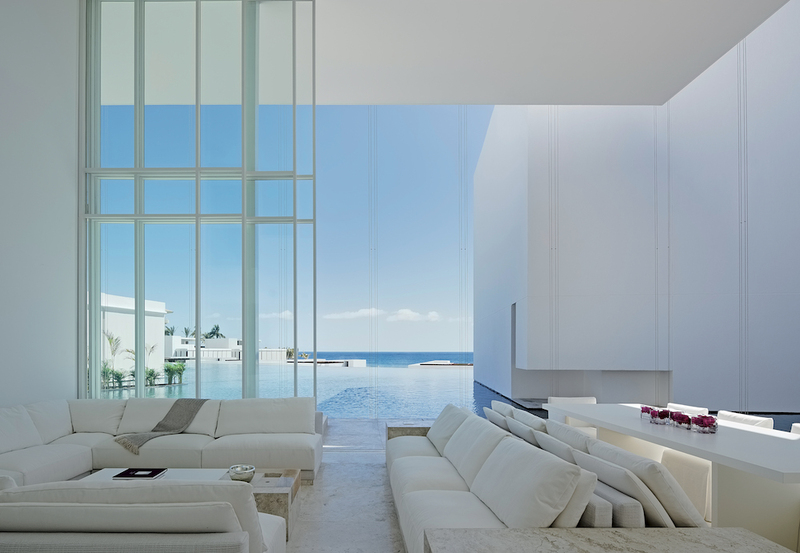 Gleaming ultramodern white cubes are arranged in a crescent to guarantee views of both sea and the angular architecture, are all around. At the centre is an airy restaurant built to resemble a kind of floating nest – the exterior structure is made of small branches woven together by skilled local craftsmen. 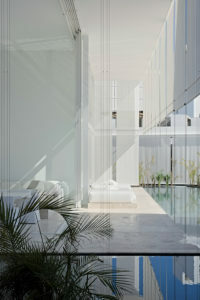 The Nido (Nest) is surrounded by a pool on three sides while the fourth looks straight out to sea. Other facilities include a private Beach Club with palm trees and green lawn plus two saltwater pools, a private cinema, yoga and Pilates studio, several different restaurants and bars, and stores, making it quite a self-contained resort. Angel Miguel Aragonès maintains that architecture must create a sense of well-being: “For me architecture has to give at least a little peace for whom inhabits it, I would say this helps thinking better but also feeling better.” In fact, Mar Adrento feels very much like a Zen retreat – with, of course, that extra sense of tranquillity that true luxury creates. 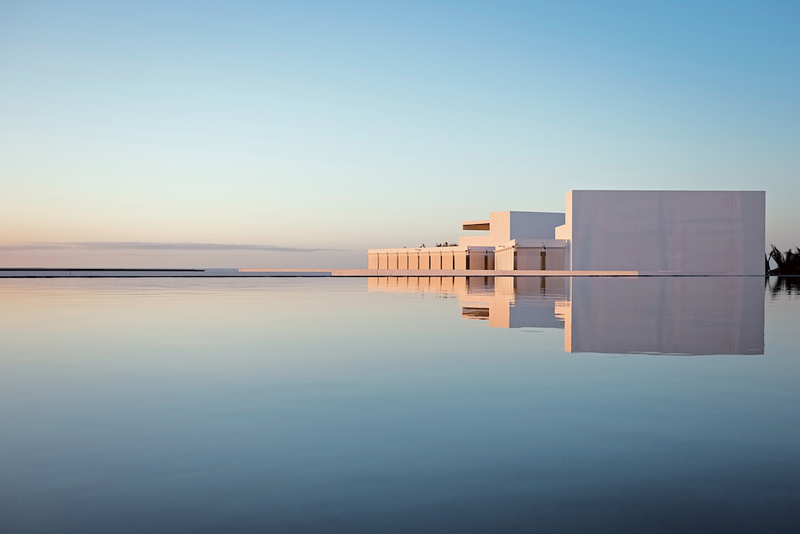 Mar Adentro offers guests a choice of 145 rooms, 65 suites and 25 villas. All the various spaces feature natural materials with Travertine setting the tone and tailored details exuding a spare simplicity. The interiors echo the geometric aesthetic of the exteriors but despite the latter’s almost austere lines, the hotel has a deliciously cocoon-like, welcoming atmosphere. The designer interiors are the work of Poliform which created everything from the parquet flooring to the wainscoting, doors, fixed and freestanding furnishings (kitchens and bathrooms included!). The colour palette has a natural feel to it too with soft, subdued hues used. The 3 and 5-bedroom villas are exceptionally spacious with between 1,950 and 3,360 square metres of floor space apiece – not counting balconies and roof terraces. The 145 cube rooms, which offer upwards of 500 square metres, have ocean views. 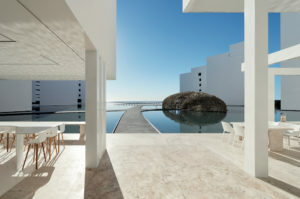 All are furnished with one-off pieces made by the Italian firm, Exteta, which also worked on the outdoor spaces at Mar Adentro with Studio Taller Aragonès. The rooms are simple of line but are exceptionally luxurious in terms of their accessories – keypads and tablets are used to set room temperature, play music, open and close the drapes, and even order room service at midnight. Mar Adentro also has a quirky programme of artistic and music events. The communal areas feature works by established and emerging artists alike. Thanks to a partnership with the Hotel Cafè in Los Angeles, which enjoys an international reputation for the quality of its music, guests can also enjoy live performances too. That combination of art and music creates an atmosphere reminiscent of the nearby San Josè del Cabo. Just a 10-minute bike ride from the hotel, the city is awash with superb restaurants, sophisticated but chilled night spots, street markets and art galleries. Design has finally arrived on the Mexican shore and, we have to say, effortlessly melded with both the surrounding nature and that dead straight line of the horizon.